Addicted to all things pink, stamping and scrapping! The End of October Already??? Hello all! I know I've been MIA for a bit again...just thought I'd share a few reasons why! Marching Band...Brandon! The pride of CFHS! 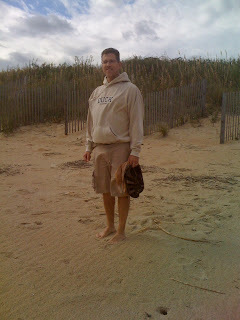 A trip to OBX...just me and my sweetie! It was really windy! A field trip to Cows and Corn with Jackson! 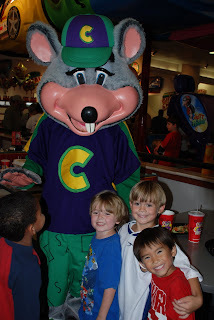 A birthday party at Chuck-E-Cheese...painful! And some seriously crazy kids! Okay, so there are my excuses! Here is the Scrapbook Club layout for September...and we are almost to October's meeting! We used the Cool Kids Simply Scrappin' Kit last month! So cute! I just love these kits...so fast and easy to use! By the way, have you checked out my countdown to New Moon??? Already have my tickets in hand...do you have yours? Okay...I have to get up SOOOO early tomorrow and need to go to bed BUT, I had to post these pages I did with Stampin' Up! 's My Digital Studio! Demonstrators have it now and customers can get it October 1st! It is AWESOME! I did these pages in no time at all with pre-made templates! Check it! Aren't these totally too kool for school??? I mean, seriously! 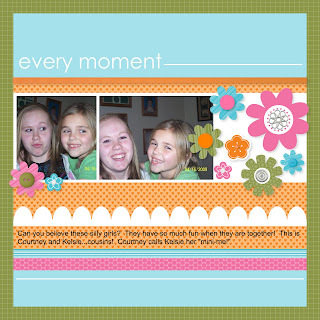 Scrapbooking has never been so beautiful and easy! If you are like me and you like the texture and 3-D look...no worries! Hybrid scrap! Do your pages digitally and then add some ribbon or a pop-up scallop! Sa-weet! My next scrapbooking trip is going to be me, My Digital Studio and a blankie (pink, of course!)! Okay, so I realize I am really bad at the blogging thing, and yet, I continue to press on! It has been super busy with the end of summer and getting kids ready for back to school, but alas, I am childless through the day, M-F! I didn't ever think I would see the day! I haven't gotten lonely thus far, but hey, they just started...that could change! For my scrapbook club ladies, above are our pages for August! I gave each of you measurements on a little direction sheet so you should have them handy with your packet! Tomorrow (I know, gasp! Two posts in a row! ), I am going to post some pictures of the NEW MY DIGITAL STUDIO! Just some pages I threw together today...EASY! You are all going to want this program! I LOVE this stamp set and ribbon! We have this new striped ribbon in several colors...including Pumpkin Pie, which is going to look so awesome on Halloween cards and projects! Totally love this card! 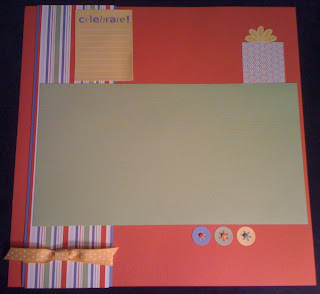 This is made with the Razzleberry Lemonade designer series paper and the On a Pedestal stamp set...SO stinkin' cute! Love it! Our new Tall Tales designer series paper and Animal Stories stamp set...just YUMMY together! Love, love, love the alphabet sets ANYTIME! 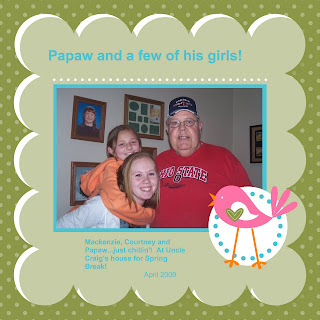 They are great for scrapbooking and so much more! So I hope these cards have given you some inspiration! They are all swaps I did for convention and we have made some of these at my house for Stamp Camp! So if you like these cards...COME TO STAMP CAMP this month! Then you will also get to make cool projects! I am also booking parties for the next couple months so now that the kids are back in school, it's time for mommies to have some fun! Contact me and we will set a date for us to have a girl's night out! Gayle and me at Red Rock Brewery for dinner in our AWESOME SU hoodies! Shelli and Sterling sitting behind us during Brian's class! So cute! I usually get a photo with Shelli and an autograph each year but didn't get a chance this time so I got this pic instead. I'm good with it! Jane, Gayle, Christina Crawford (our SU rock star! ), Debbie and me! Fun! Finishing up our make and takes! Back: Gayle, me, Jane. Front: Karen, Debbie, and Becky! The Go-diva swap group totally rocks! Back: Becky, me, Gretchen, Jane. Front: Evette, Selene, Robin (yay Robin! She made Advisory Board this year!) and Tiffany! Jane and I on stage for our 5 year walk with Stampin' Up! Woo hoo! General Session...Jane, Becky and 3000 more Stampin' Up! demos! Our theme this year is SU's new tag line: Inspire, Create, Share...me, Gayle and Jane. Robin and me...kinda blurry pic but oh, well! So here are some people pics...I will try to post some project pics later this week! We had so much fun! You should join my team so YOU can have fun with us next year at Convention! Check out the special below! 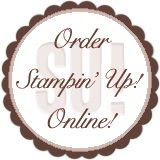 Only $85.00 and you can get in on the fun with Stampin' Up! Check out this great special!!! I am also offering an additional three classic ink pads of your choice and a special convention only gift if you sign up by August 31st! This is a fantastic deal!!! Wether you want to earn money or save money, this is a great opportunity! contact me today for more details!!! 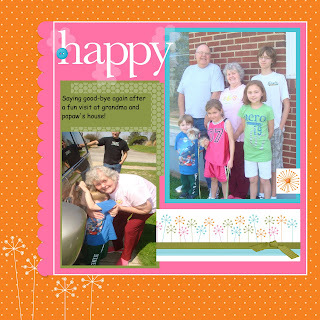 June's Scrapbook Club pages made with our easy, peasy Simply Scrappin' Kits! Okay, I did make this one...for a swap a while ago...I *love* Just Jawing! 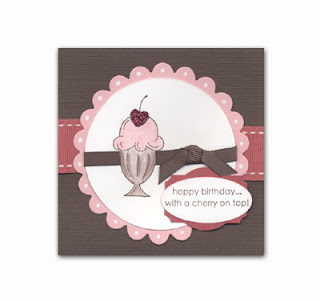 I didn't however, make this little ice cream gem of a card! Love it! 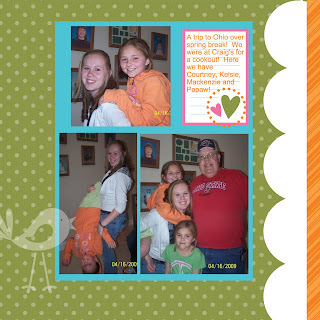 Enjoy a few more scrapbook pages! Sorry! Sorry! Sorry! I am so bad at this! Things were so busy with the end of school, camps and a trip to the beach! Then we came home to the death of a close, young friend and well, that's what's been going on. Anyhoo, here is last month's (June's) Scrapbook Club pages and a few more added in, just because I was gone for a while! I'll also throw in a couple cards but they were not done by me, so if they were done by YOU, let me know and I'll give you credit for your AWESOME work! 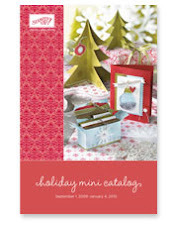 The new catalog is out as well! It is beautiful so give me a holler if you want to place an order! There is also a GREAT sign up special going on! Contact me for details! Hope you all had a great 4th and I'll try to post more than once a month!!! Scrapbook Pages Galore and Happy Birthday to me! Yes, today is my birthday! I am celebrating by having a pajama day! 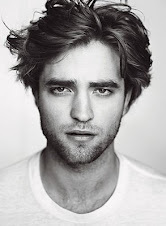 Okay, first, I have to ask if you all saw the New Moon trailer last night??? Woo-hoo! It's going to be totally AWESOME! And now on to stamping! 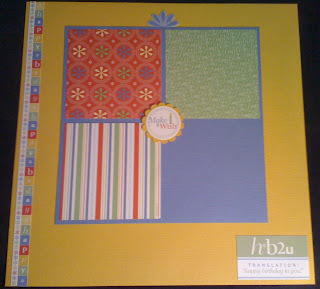 The first 2 pages are what we did for Scrapbook Club last week...I love this Simply Scrappin' Kit! Totally my colors! And perfect for summer! On Saturday I had an all day scrapbooking event and made some 6 x 6 pages to sell and we did a 6 x 6 make and take! We had a great time hanging out and getting scrapbooking done! Here are some of the 6 x 6 pages...hope you enjoy them! I will post more later! Have a great day and happy stamping! Hello! I am an independent Stampin' Up! Demonstrator...I love what I do and share what I love! I am a SAHM of four awesome kids and wife to my wonderful husband, Tim! I will try to post often with some things that inspire you to get creative! I hope you enjoy the site! Got something to say? Tell me! 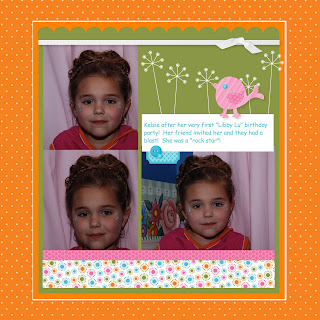 Check out my Stampin' Up! Website for a calendar of events and ordering! Order anytime, day or night! Just click the shop now! button in the upper right hand corner! Excited for New Moon??? Me too! Check out Shelli Gardner's Blog! Shelli Gardner, the CEO and Co-founder of Stampin' Up! is blogging! and it's taking over the stamping world! Ask me how YOU can own one! A fabulous way to decorate your home, office or whatever you fancy! Wow – get a FREE Big Shot or up to $100 in FREE products!! Wish Big with Pennant Punch!